Welcome to my Small Arms page! 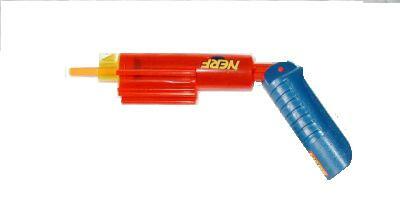 Here you will find info on many smaller Nerf blasters. However, mnost of the guns are out of date and don't meet up with today's standards, so I have the ones that pertain to today listed first, followed by the others later on. The Lock n' Load is an excellent pistol by anyone's standards. It has excellent range, is fairly easy to modify, and it looks really cool. However, it recently has been removed from the limelight due to the introduction of the Nite Finder. Still, an excellent gun that anyone should be happy to own. The Sharpshooter 2 is right up there with the Lock 'n Load in the realm of classic, good pistols. Though it is bigger than the Lock 'n Load, it has its advantages. 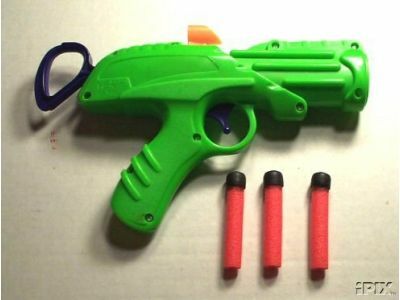 It has two barrels that the user can switch between with the green pump on the front. 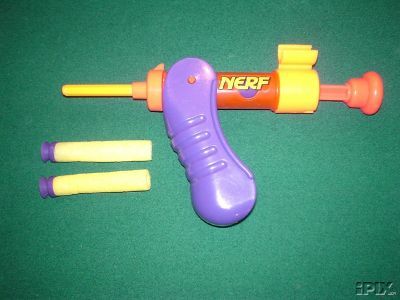 It is also incredibly easy to replace the barrels, or to mod it so that both shoot at once. Most (including myself) consider the Lock 'n Load a better choice when just selecting from the classics, but if you have one that is in good working condition, you have no reasons for complaints. The Tech Target Pistol is an excellent sidearm. Many favor it over the Nite Finder, but that is an argument that can go either way. They are easy to open and fairly simple to mod. Excellent ranges for a pistol (though I find both my Lock 'n Load and Nite Finder going farther). The only problem is the hefty price tag, due to that stupid electronic target it comes with. It comes stock shooting megas, but can be easily altered to shoot micros with PETG, Brass, etc. The Nite Finder is the best pistol on the market. That statement is debatable, what with the Tech Target Gun out and all. Nevertheless, it is an excellent pistol. It has excellent ranges even after simply removing the restrictors. The stock barrel is quite good in it's own right, but the gun is incredibly easy to replace the barrel on, and works great with PETG or brass. Removing all of the stupid "laser" components makes it extremely light, and you can cut it down to look like a PPK to make it very holsterable. I use my brassed one every war I go to. If you don't have one, you need to get one. The Coral Viper is not worth your time. It's inconveniently placed plunger coupled witht he swinging-head action make it hopelessly inaccurate. Thow in it's sub-par ranges, and you come to the end of my little chat. 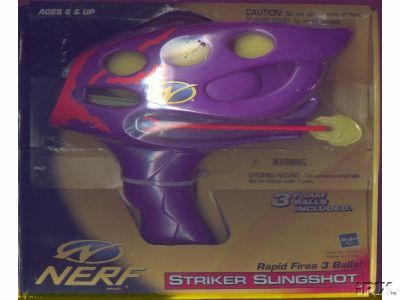 Back in it's day, the armorshot was a very neat little novelty gun from the Cyber Stryke line. Nowadays, it's a very neat little novelty gun fron the Cyber Stryke line. In short, it's use of megas somewhat outdates it on the west coast, and its lack or real power outdates it on the east coast. Lots of ammo storage, though. The Auto grip is just like the armorshot in terms of being out of date and a really neat novelty item. Except it's cooler. 'Cuz it flips up into your hand. Still, they're lost to the ages as classics that will never really see use at any large wars again. I will give that it was a nice idea, but the suction cup never stuck to walls very well, so pulling on its trigger string to shoot at someone typically pulled the whole thing off of the wall. On top of that, the string was fairly short. I suppose you could use it in an indoor war, but no non-private wars are indoors anymore. A typical one-barrel push-firing boomstick from the dark ages. Decent ranges, but no real use in a war, even back then. Hide it in a desk drawer in your office cubicle. 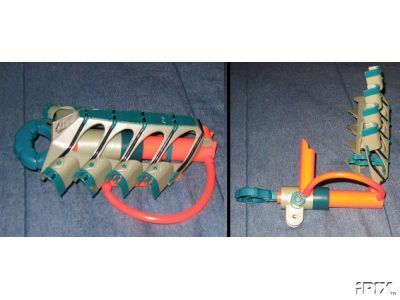 Basically, a sad excuse for an indoor, tabletop stomp rocket. One of the less-seen, less-successful guns from the Max Force line of foam-firing annimals. One of the more interesting pocket weapons. 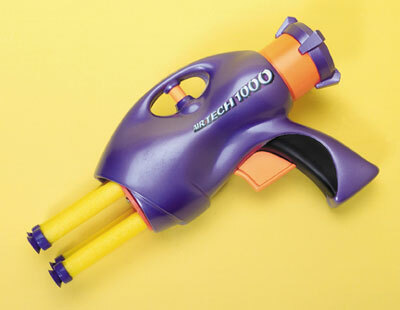 The microscopic handle slides up into the gun, and the barrel turns around to the side to make the gun become a small rectangle of plastic about five by two and a half inches. It folds. But its ranges kinda stinks. Even with bands. Oh well. The small handle (when it's extended) is hard for an infant to grasp, much less yourself. Never used anymore because its ammunition is extinct, the NB-1 was the first dart/arrow/missile/whatever firing gun. It uses the push-pull firing system. It got decent range for its day. Still, today is no longer its day. It's a pistol with a very awkward trigger location. The plunger is also a pain, being at the bottom of the handle, making banding more difficult, because the bands have to stretch across the place where your hand is supposed to go. Don't bother. 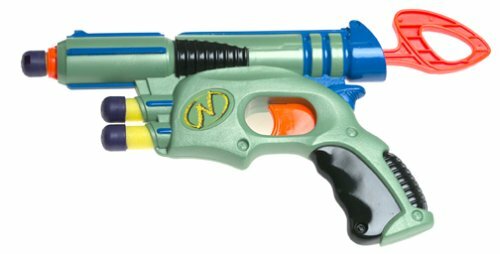 The misslestorm is one of the first multi-barreled guns by nerf. However, its missles are now history, and its barrels get bent very easily. Poor range by today's standards, but still fun for the kiddies I suppose. 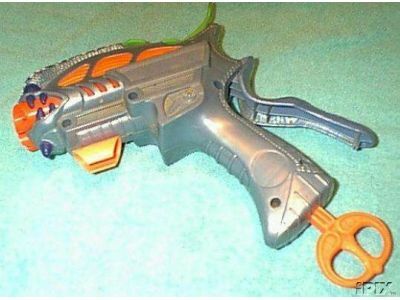 One of the more creative pistols Nerf has made. Not too shabby either, with the whole "hidden barrel" thing. 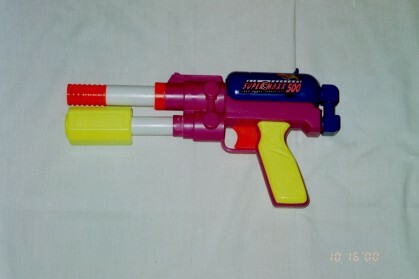 It's also a fairly simple mod to move the second barrel to the front and even add a third. A great way for beginners to learn the ins and outs of basic modding. As for using it, even bands really can't help its range much. Their ancient ammunition type makes them really hard to actually use, though it is possible to replace barrels on them and such. I've heard rumors about pretty good ranges coming from these suckers, but I don't know anything for sure. 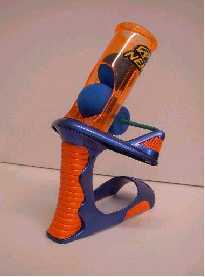 They were, however, the first real pistols by nerf. Just to give them some credit. A very small, folding, one-dart push-puller to hide in your desk and hit the person in the cubicle next to you with. But only the cubicle next to you. A decent pistol from the Max Force line that shoots two micros at a time. Not much else to say. Not too bad. A barrel relocation mod can make them semi-decent, but they're not that commonly seen, and they're never really seen at wars. I refuse to comment on these three. Another, more well-known Coral Viper from the Max Force line. Quite famous actually, but not for their capabilities. Just for their looks, and the funky tail thingy. Nerf was strugling, and needed something to put on the market fast. At least, that's my excuse. 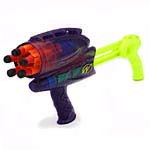 It came out around the same time as the Powerclip, Splitfire, etc., but it's a push-puller, and nobody really uses them. A four-barreled springer from the airtech line that I still have yet to see used in any war. They just don't get the ranges needed in this day and age.